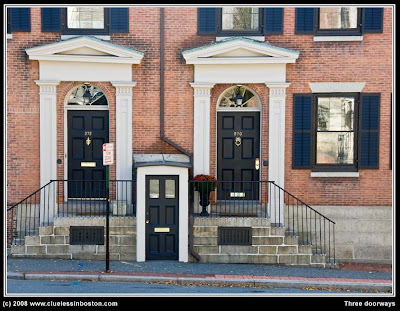 Because I've missed a few Wednesday doorways the last few weeks, I present a triple this week. Three in one!! Atta Boy!!! This is great! My students are going to get a copy of this photo (with your photo credit of course) as a story starter! I see traces of Alice in Wonderland or Gulliver's Travels- modernized! What a wonserful shot! Oh, that is very cool! The door in the middle really plays a trick on your eye, as if to say, "There's no third door here." You have to look again before your brain registers "Hey, there's a third door!" Thanks for visiting me at Sydney Daily Photo while I was away. I’m back from Queensland now and transmission should resume as normal. A trifecta of fine entryways!